In our commitment to help you find products that can help you achieve your most beautiful skin, we present to you the 5 best rose water toners you should get your hands on today. The products that made it to this list have been carefully selected and reviewed based on their ingredients, skin benefits and value for money. 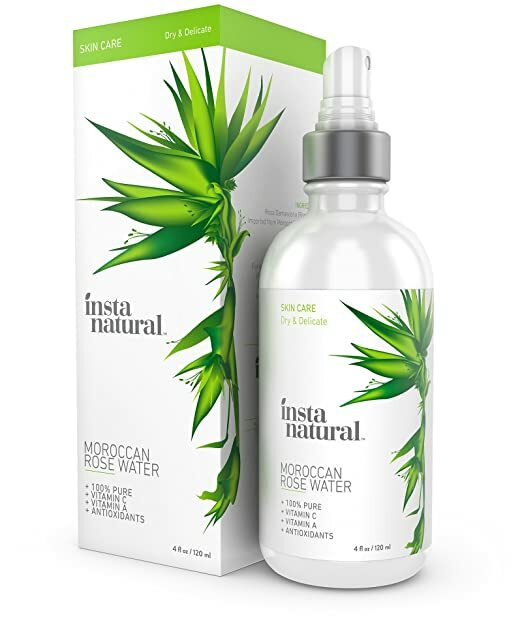 In the review, we liked that Instanatural Moroccan Rose Water contains a 100% pure ingredient. Aside from being a toner, it can also work as a good facial mist. The product has visible effects on pores and skin texture, but its scent may not work for everyone. 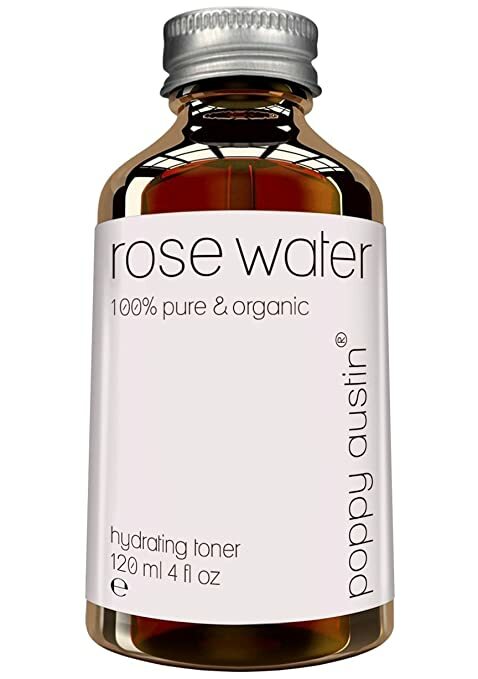 Compared with InstaNatural, Poppy Austin 100% Pure Rose Water Facial Toner costs more. It has undergone traditional distillation so you get 100% pure rose water. First Botany Cosmeceuticals Rejuvenating Rose Water Toner contains the lowest organic rose water content in this list at 82%. This, however, doesn't mean that the product falls short from its competitors. In fact, this toner is great to use for several purposes. We liked that aside from toning the skin, it can also be used to de-stress and sooth skin post shaving. Packed in a 120mL glass bottle, Elma and Sana 100% Pre Moroccan Rose Water also doesn't have any extra ingredients. It's good to use even if you have a breakout prone skin. Similar to other rose water products, its main issue is its scent. While some users enjoy the fragrance, there are quite a few who detest its musky smell. 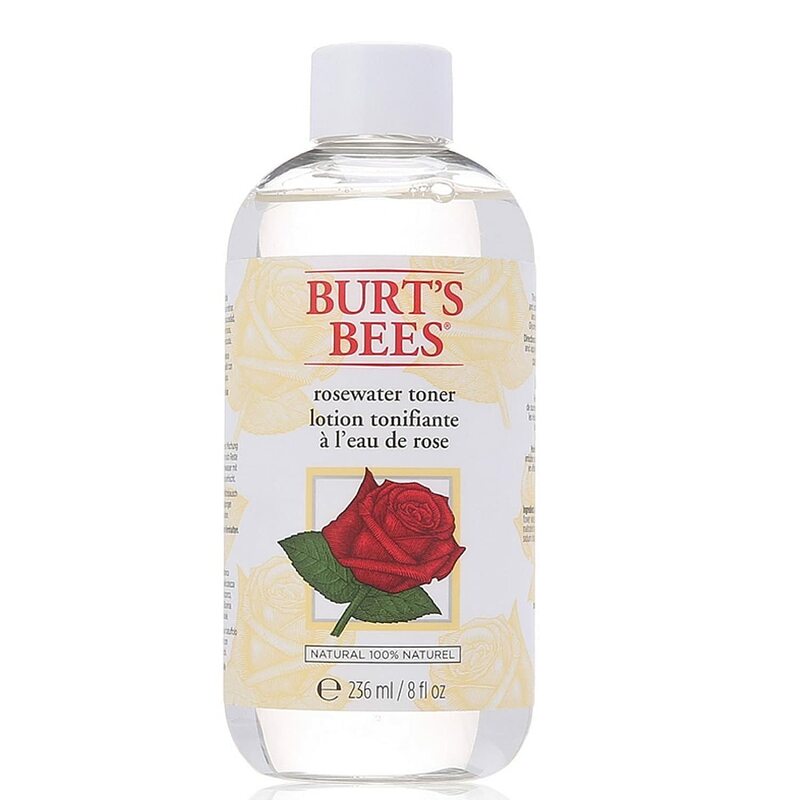 Burt's Bees Rose Water Toner has more product to offer at 236mL. However, although it weighs more, it only contains 99.9% rose water content. It may not have a pure rose water content, but this toner still delivers in terms of cleansing and nourishing. In case you have extra sensitive skin, we suggest trying the product on a small area of your skin first. Read on as we reveal the best rose water toner and how it can dramatically transform your skin. InstaNatural Moroccan Rose Water doesn’t contain any artificial ingredients or synthetic scents. Because it’s made from 100% rose water, you’re sure to get its purest effects. Like most products that contain rose water, this toner is good to use on any skin types. It’s even beneficial for prepping up sensitive skin for serums and moisturizers. For its price, you get a 120mL product. Because it contains a lot of product, one bottle can last you quite awhile. Aside from acting as a toner, you can even use it as a facial mist. It’s perfect for refreshing your skin during a humid day or when you just need a boost of freshness. You can also use it as a makeup remover, for your hair treatment and even for aromatherapy. Most people who used the toner liked that it made their pores less visible. They are also fond of its softening and hydrating effects. InstaNatural Moroccan Rose Water comes in an amber bottle with a screw cap. The liquid is clear and comes with a mild rose scent that fades as the product dries on your skin. This product contains pure and organic rose water. Since it is unrefined, you get its best antioxidant and nourishing benefits. Poppy Austin uses only its finest roses in this toner. It relies on traditional distillation process, so it doesn’t entirely lose the essence of its ingredient. The product is safe to use even on sensitive skin. Well, it can actually work on all skin types. Aside from its hydrating effect, the toner can also give your skin a glowing appeal. It can make your complexion more youthful, plump and vibrant. The toner can also bring back your skin’s natural pH and keep your skin’s oil production under control- without leaving it dehydrated. People who have used this toner found their skin soft and smooth after application. However, for its price, some of them consider the toner a bit expensive. Aside from hydration, the toner can also help diminish acne scars and uneven skin tone. It will leave your skin fresh and dewy the next morning. 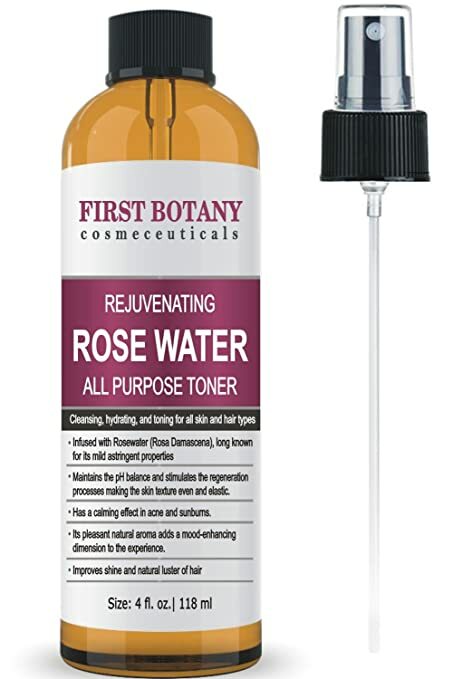 First Botany Cosmeceuticals Rejuvenating Rose Water Toner is a multi-purpose toner. Aside from your skin, you can also use it for your hair. It can also be used to soothe skin after shaving, too. It’s also a good makeup remover as well. The product also works well for aromatherapy. If you need more than skin pampering, then this toner can definitely do the trick. In terms of content, it only has an 82% organic rose water content. Although lower, the toner is still potent enough in toning and hydrating the skin. The nice thing about this rose water toner is that it comes with a spray. This means easier dispensing, especially when you’re on the go. You can just spritz it on your face for an instant pick-me-up. Although the product works well as it claims, most users are a bit comfortable about the idea that it has phenoxyethanol. It’s a form of glycol commonly used as a cosmetic preservative that has been declared non-toxic. Elma and Sana 100% Pure Moroccan Rose Water can give you more than your money’s worth. Having no additives, it delivers its toning, cleansing and moisturizing properties well. After application, most users felt their skin clean and fresh. The product is gentle as it doesn’t cause breakouts even on sensitive skin. The product comes in a 120ml glass bottle. It has this typical rose scent which can make you feel relaxed and at ease. Take note that the scent can linger for quite sometime. However, if you are extremely sensitive, you may find this fragrant mild to too strong. One of the things that can easily attract you to this toner is its anti-aging and anti-wrinkle properties. Apart from aging skin, you’ll also love this one if you have dry to oily skin. Burt’s Bees Rose Water Toner offers 99.9% natural content. It’s gentle enough that you can use it everyday. For its price, this toner offers more quantity at 236mL. Because it contains more, you’ll generally have more product to work on. It’s packaged in an elegant clear bottle, which is a good treat considering its price. Its scent is also crisper and more refreshing. When it comes to effects, the product goes smoothly on the skin. It effectively removes makeup while hydrating the skin. Because it doesn’t contain pure rose water, you have to be cautious in using the toner, particularly if you have extra sensitive skin. Although most users who have delicate skin didn’t experience any adverse reaction, it’s still wise if you can do a sensitivity or patch test first. Is Rose Water A Good Toner? The use of rose water in skin care products isn’t actually new. A lot of women have used roses as part of their beauty routines , from bathing to topical application of its oil, for several generations already. Because rose water has an innate antibacterial property, it’s particularly effective to use on breakout prone skin. Aside from that it can treat existing acne, it can also be used to prevent pimple formation. Rose water is also good for people with dermatitis, eczema and sunburn. Besides its capability to kill bacteria, it has a soothing effect as well. By boosting hydration and locking moisture in your skin, rose water can help diminish the signs of skin aging. It can tighten your skin without making it feel overstretched and dry. It cleanses your skin deep enough to thoroughly get rid of dirt and makeup. It helps make pores smaller to make them less visible and prone to clogging. It’s relatively easy to find rose water toners today. Because of how in demand they are, you’ll probably won’t have any problems buying one either online or from your local store. Rose water should be clear and transparent. If you see any other color in your product, there’s a good chance that it isn’t a pure one. Rose water toners come inevitably with rose or floral scent. In case your product smells rancid, it’s best not to use it anymore. Always make it a habit to read product labels, particularly if you’re looking for a good toner. Any indication of alcohol content can mean a drying effect on your skin. Reading product labels can also help you distinguish authentic rose water toners from toners simply infused with rose scent. Aside from ingredients, you should also keep an eye out for cue words such as “distilled” and “organic”. These words will tell you if your rose toner is pure and chemical-free. Rose water is one of today’s most hyped skin care ingredient. Because of how in demand it is, getting mislead is relatively easy. To get straight to the point, we’re placing Instanatural Moroccan Rose Water as our top pick. This toner is made from 100% rose water which means you get to experience its purest benefits. We particularly liked that its scent isn’t too strong. However, you should still take note that scent tolerance may vary from one person to another. At $11.37 for 120ml, we think this toner is already a good deal. Since you get more product for the price, you’ll have enough rose water to use on your face and even your hair.